1. Digitally replace all Budweiser with Coors Light and/or Miller Lite. What a way to ding the competition! And if Paramount wants to throw in a new line of dialogue from Denzel about how those Vented Wide Mouth/Punch Top cans are total BS, yeah, sure, why not. 2. Digitally replace all Budweiser with heroin. Instead of having Denzel sipping Buds, have him doing heroin. Everyone knows heroin is horrible. Even the National Heroin Processors Board would have a tough time objecting to this one. 3. 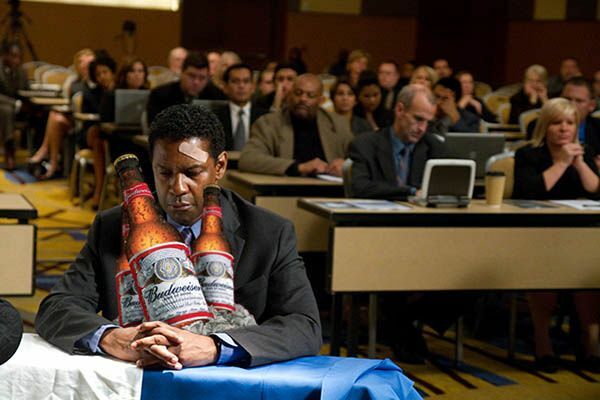 Keep the Budweiser in the movie, but make Denzel shoot a Budweiser commercial that runs at exactly the halfway point of every screening of Flight and is also in the DVD/VOD/Netflix version. Maybe he’s riding a Clydesdale around? Maybe he’s one of the “wassup” guys? Who knows?! Have fun with it, Anheuser-Busch!